On the day of Donald Trump's inauguration, we're getting together to start healing the divisions of 2016 and bulding bridges in our community. The words of Martin Luther King - someone who confronted division and injustice in America - are a particular inspration: "Let us live together as brothers and sisters in a community". 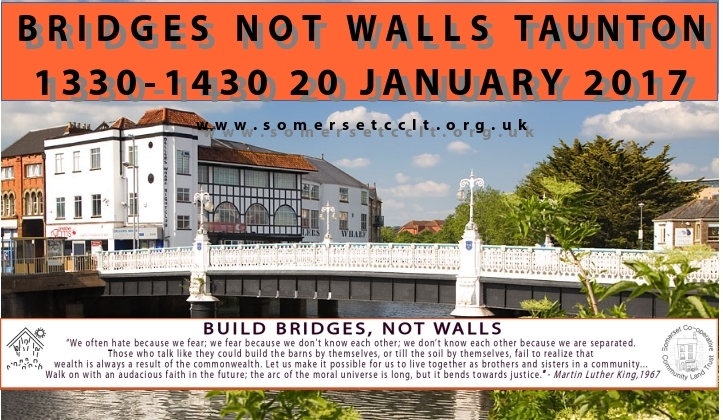 Join us on Taunton's oldest bridge to show your support for building bridges between all the different groups that make up our community, so we can work together for all our futures.